The Big Mesa is ready to tackle the toughest terrain and snow!! Fun! Control! Agility! Flick-ability! Lightweight! 26+ or 27.5 Wheels! Boost Front and Rear! 120mm travel Rock Shox! 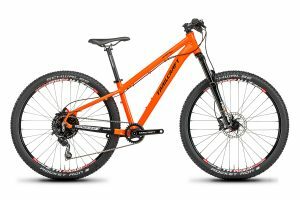 All in an amazing new 26+ machine from Trailcraft Cycles! Dominate the trails in just about every type of riding condition you can find with our new Big Mesa 26 Plus mountain bike. 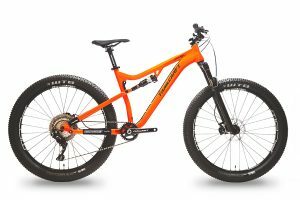 Way too many advantages if you are new rider to the sport, or maybe you are more advanced and want to dominate the sickest lines on your roughest trails with a PLUS sized hardtail. We’ve taken an old-school wheel size and plumped up the tires a bit – but not too much – giving it a “new-school 26-Plus geometry treatment designed for riders of a shorter stature wanting the ultimate fun play bike with big tires and a low weight right out of the box. Nothing more to modify to make it lighter. We built the best plus bike with the best components for you so you can spend more time riding. Our new Big Mesa 26+ comes in at weights under 25 pounds (with pedals!) depending on the build level with best in category components in a “plus” level package. Stans Flow MK3 wheels, 85 gram ultralight rotors, an extended range 11-42 cassette and direct-mount cranks with aluminum spindle typically found on much more expensive bikes. As with all our models, our end goal is to build the lightest production 26+ mountain bike with category leading components. This is a fun, playful, and super stable bike for all types of riding. 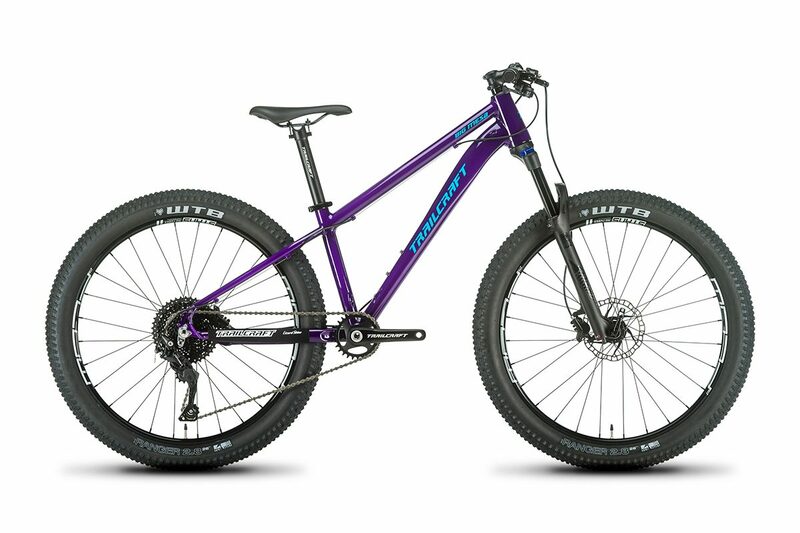 The Big Mesa 26+ is built for the natural progression and next level of riding with some key geometry features designed specifically for riders of young and old! 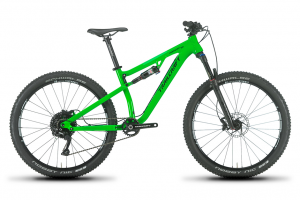 The Big Mesa 26+ gets the Trailcraft Cycles "New School 26+Geometry Treatment" with a slightly steeper seat tube angle for amazing climbing and a short 425mm chainstay length in a package designed as the ultimate play bike. The Big Mesa comes standard with a 26+ wheelset, or you can add a 27.5 wheelset later if you want to switch up the fun down the road if your mood changes. Available in two sizes: XS size (riders 4’10-5’2”) or S size (riders 5’2”-5’6”). Trailcraft Cycle Introduces The Big Mesa 26 Plus from Trailcraft Cycles on Vimeo. 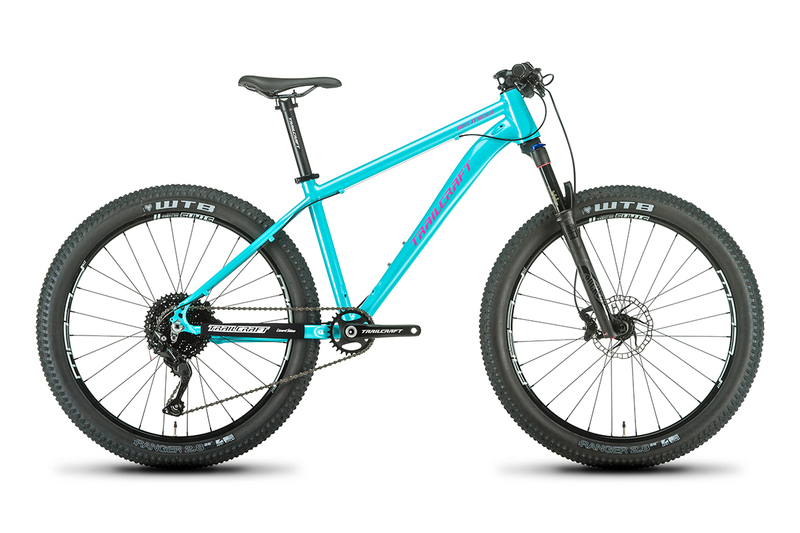 The Big Mesa 26+ is the best feature packed 26+ bike with a high performance geometry, lightweight components and for a limited time - FIVE cool color options to choose! Each Big Mesa 26+ frame is hand built in small batches with double butted 7005 series aluminum tubing with a super stiff hydroformed down tube, semi-integrated tapered head tube with inset style headset, forged dropouts, and post-mount disc brake mount. Total weight for a complete bike starts in the sub-24 pound range (WITH pedals) in a 1x drivetrain setup for an XT level Pro build. This is next level performance in a category leading weight for wider rubber plus bikes! Stans Flow MK3 rims laced with 28 spokes to superlight BOOST hubs creates a category leading 26+ wheelset. All three build levels come with this wheelset. The MK3 Flow rim is wide, light, and stiff. It’s perfect for the 26x 2.8” WTB Ranger tires while being the leader in wide (and very light) rim technology. WTB Ranger 2.8” tires set up tubeless keep the weight low and so you don't have to worry about fixing flats. We include two 26+ tubes with your purchase. Finally, Ashima 85 gram rotors have been spec'd to keep wheel weight as low as possible to keep performance levels high through lowest possible rotational weight. Pro XT Shimano M8000 - 1x11 component group featuring Shimano XT rear derailleur, XT 11-42 rear cassette, XT 11 speed rear shifter, and XT front/rear brakes. A true and complete XT M8000 level package to keep weight low and performance high. NEW IN 2017 is our custom Trailcraft direct mount 1x crankset with ultralight aluminum spindle and 26, 28, 30 or 32 tooth narrow-wide style chainring YOU select to create the best bike for your terrain. Pro Deore M6000 1x10 group adds a Sunrace 11-42 wide-range cassette with 42t alloy cassette cog to keep weight low. A true and complete Deore M6000 level package to keep weight low and performance high. NEW IN 2017 is our custom Trailcraft direct mount 1x crankset with ultralight aluminum spindle and 26, 28, 30 or 32 tooth narrow-wide style chainring YOU select to create the best bike for your terrain. Special Build Level 1x10 components featuring Shimano Deore M6000 rear derailleur, Sunrace 11-42 rear cassette, Zee 10-speed rear shifter, and Shimano 396 hydraulic brakes. A great package to keep weight low, performance high, and the budget in check! Our Special Build also gets our custom Trailcraft direct mount 1x crankset with ultralight aluminum spindle and 26, 28, 30 or 32 tooth narrow-wide style chainring YOU select to create the best bike for your terrain. For more detailed information please click on Description, Specifications, and Geometry tabs. 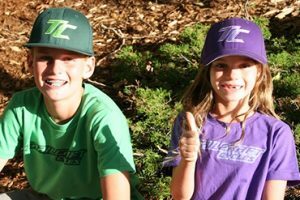 TIRES WTB Ranger 26 x 2.8" WTB Ranger 26 x 2.8" WTB Ranger 26 x 2.8"
I am 10 years old and my name is Caden. 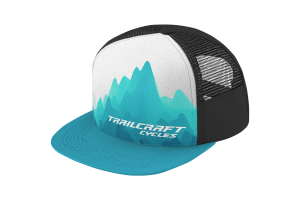 This is my second Trailcraft bike. My first Trailcraft was the Pineridge 24. It was awesome. The Big Mesa plus size tires are even better. They give me better balance, control, and confidence. My dad installed a seat post dropper for my bike and it is awesome. This is a great bike and I will ride it for the next couple years or more.